The Nashville Predators are devouring the competition these days. Winners of five straight games following Saturday’s 3-0 shutout win over the Edmonton Oilers, the Predators are the top-ranked team this week in TSN`s 7-Eleven Power Rankings, according to consensus rankings formulated by the TSN Power Ranking panel of Ray Ferraro, Jeff O’Neill, Jamie McLennan, Craig Button and Darren Dreger. Last season’s Presidents’ Trophy winners, Nashville – ranked No. 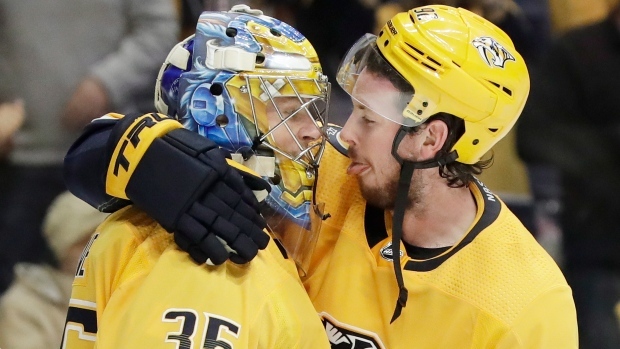 2 during the last two weeks – won its last two games despite an injury to Vezina Trophy winner Pekka Rinne, who has hurt in a collision with teammate Kevin Fiala during the third period of Friday’s win over the Calgary Flames. Backup Juuse Saros was impressive in relief and followed that up with his shutout over the Oilers the next night. With Nathan MacKinnon and Mikko Rantanen both riding a five-game point streak, the Colorado Avalanche move up five spots to land in the No. 2 spot this week after going 2-0-1 since last week’s Power Rankings. The Tampa Bay Lightning leap five places into the No. 3 position this week after winning three and garnering a point in overtime, while the surging Winnipeg Jets (No. 4) also climb five spots from their No. 9 ranking a week ago. Meanwhile, the Toronto Maple Leafs, last week’s top-ranked team, drop four places to round out our panel’s top five after scoring just one goal in two straight losses – 3-0 to the Pittsburgh Penguins and then 4-1 to the St. Louis Blues on Saturday night. The remaining top-10 teams in this week’s rankings include: the Boston Bruins (No. 6), falling three spots after going winless in Western Canada; the No. 7 Montreal Canadiens, jumping six places after an impressive 2-0-1 record last week, the Anaheim Ducks at No. 8, slipping two spots despite impressive work from John Gibson in net; the No. 9 Chicago Blackhawks, moving up two places from last week after Corey Crawford (1-1) returned from his long concussion recovery; and the New Jersey Devils at No. 10, falling from No. 5 after two straight losses. The No. 12 Minnesota Wild make the biggest jump of the week, surging 12 spots from No. 24 last week after going 3-1-0, while the Dallas Stars have the week’s most significant drop, plunging 13 spots to No. 23 after the Stars’ scoring machine ran out of gas in three straight losses after being in the No. 10 position last week. Besides No. 4 Winnipeg and No. 5 Toronto, the best Canadian teams this week include the No. 7 Canadiens, the No. 11 Vancouver Canucks, the No. 13 Ottawa Senators, who climb seven spots from a week ago, and the Calgary Flames at No. 16. The Oilers move up to .500 with overtime wins over the Jets and Bruins before their shutout loss to the Predators to sit at No. 25 from No. 27 a week ago. The worst teams in the NHL this week, according to our panel, include the No. 27 New York Rangers, the Florida Panthers at No. 28, the Los Angeles Kings - dropping eight places to No. 29, the Arizona Coyotes staying put at No. 30 while the Detroit Red Wings, despite earning their first win of the season, remain dead last for a second straight week. The loss of a Vezina Trophy winner would be a lot worse if Juuse Saros wasn’t the backup. In his first start after Pekke Rinne’s injury he earned a shutout. P.K. Subban had his first career shorthanded goal. They’re are on a five-game point streak and Mikko Rantanen and Nathan MacKinnon have at least a point in all eight games. Gabriel Landeskog has helped the cause with six goals in his last three games. Take away Tampa’s first two games and they have a record of 4-0-1 and have scored an average of five goals a game. And Steven Stamkos, with just one goal, has yet to get on track. There’s no place like home for the Jets, who are in a six-game stretch in Winnipeg where they’re 4-0-1. Dustin Byfuglien returned from an injury to score and add two assists against Vancouver. The Maple Leafs came down to earth after a 6-1 start in which they scored at least three goals and at least one power play goal in every game. They’ve lost two in a row, scoring just one goal. Following a four-game winning streak when they outscored opponents 22-6, the sticks went cold in Western Canada – going winless in three (0-1-2) and scoring just five goals. It’s been an almost complete reversal from last year’s start for the impressive Canadiens. Instead of one regulation loss they had one win (in a shootout) and a 1-5-1 record after seven games. Give a lot of credit to John Gibson for Anaheim’s early success. His .949 save percentage is the NHL’s best, and necessary considering they are allowing the most shots per game (37.9). They allowed 55 shots by Tampa Bay, including an NHL-record 33 in the second period Sunday. But Corey Crawford returned from his concussion to earn his first win in more than 10 months on Saturday. Two shutouts by Keith Kinkaid got the Devils off to a quick 4-0 start before they suffered losses to Colorado and Philadelphia. Kyle Palmieri has seven goals in the team’s six games. The surprising Canucks have won four of their last five including OT decisions over Pittsburgh and Boston. Elias Pettersson still leads the team in scoring despite missing three of those games. An overtime goal by Mikael Granlund gave the Wild, who have won three straight, a 3-0-2 record at home this season. Since Christmas of last year they have a 20-2-8 mark at home. A three-game winning streak matches the longest the Senators had last season, and while the good early start is impressive they also had a good start last year, going 3-1-3 in their first seven. The Hurricanes put together a four-game winning streak during which time they scored 21 goals, but they’ve followed that up with three straight losses and have scored just four goals. They won consecutive games at home, allowing just one goal in each game, with Logan Couture scoring four in two games. Their 38.9 shots per game is the league’s second highest, behind Carolina. They've scored at least three goals in seven straight games, but still lost two of those seven. Elias Lindholm, with five goals, is well on his way to beating his career high of 17. David Rittich is 2-0 in net. They’re rebounding after a poor start, winning three in a row thanks to Marc-Andre Fleury who has allowed just two goals in those three games. Jonathan Marchessault has six points in his last four. The Caps have to be encouraged by a 4.6 goals-scored average at home, but discouraged about their 6.5 goals-against average in two road games, allowing seven to Pittsburgh and six to New Jersey. Matt Murray made a triumphant return from his injury, making 38 saves in a 3-0 shutout of Toronto. Evgeni Malkin is averaging two points a game with 12 points in their six games. Highlights of Buffalo’s five-game western road trip included a hat trick by Jeff Skinner. The Sabres won three of five games, including their first back-to-back wins in Southern California in 15 years. There hasn’t been much consistency to the Jackets' early season. In four home games, for example, they scored one goal in each of their two losses, and scored five and then six goals in their two wins. Goal scoring hasn’t been an issue for the Flyers, who have at least five goals a game in half of their games. The problem is that they’ve also allowed at least five goals in half of their games. The Stars have gone freezing cold. After a hot start in which they scored 17 goals to go 3-1, they’ve lost three in a row and managed to scored just two goals in those three games. Two West Coast losses surrounded a 7-2 win in Los Angeles. Robin Lehner (.925 SV %) has been a decent addition but the Islanders are still waiting for Jordan Eberle (0-2-2) to score a goal. Only Arizona (11) has scored fewer goals than Edmonton’s 13, but it could be a lot worse if not for Connor McDavid. He has a point in an incredible 85 per cent of Oiler goals (11 of 13). Tyler Bozak made a jubilant return to Toronto after nine seasons with the Maple Leafs. His teammates also have a winning recent history against Toronto, capturing nine of their last 11 meetings. The Rangers are still looking for their first regulation win but Henrik Lundqvist is doing his best. His save percentage of .921 is above his career average. Mats Zuccarello has four points in his last five games. The Panthers have yet to record a regulation win – their one win was in a shootout – but they’re still doing a decent job at picking up points, doing so in four of their six games. The return of Jonathan Quick did nothing to stop their slide. They’ve lost four in a row in convincing style, being outscored 21-5 in losses (5-1, 4-1, 7-2, 5-1). Anze Kopitar has no points in his last five. At least they’re started scoring some goals, with seven in their last two games after scoring just three in their first five. Clayton Keller (3) and Vinnie Hinostroza (2) are the only multiple-goal scorers. The Red Wings finally won their first game – thanks to three goals in just 2:03 in the second period and Gustav Nyquist’s first goal of the season to give them an overtime win at Florida on Saturday.